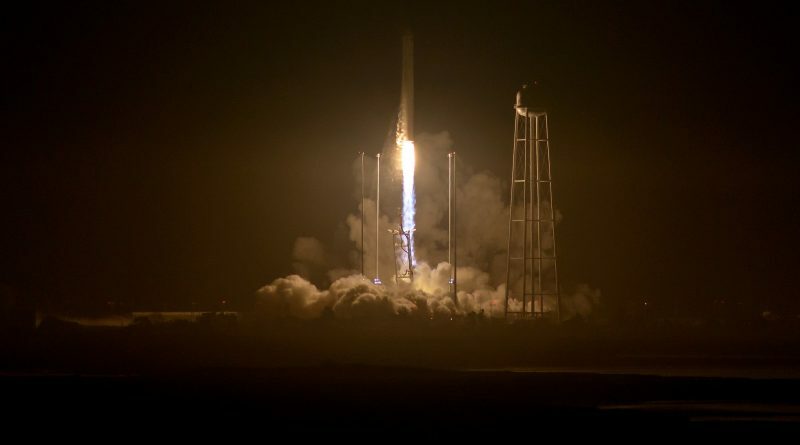 Two years after its previous mission ended in a dramatic failure, Antares lit its new engines at 23:45 UTC and rose from its re-built launch pad on a nine-minute climb to orbit carrying the 6,200-Kilogram Cygnus resupply vessel into Low Earth Orbit. 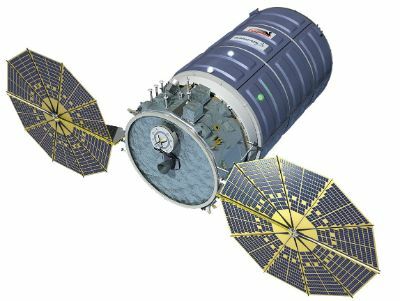 Orbital ATK confirmed the orbital delivery of Cygnus was by the book and the craft entered an extended rendezvous with ISS to give way to a crewed Soyuz capsule inbound to the orbiting complex on Friday and will be followed by Cygnus on Sunday to mark the delivery of 2,350 Kilograms of hardware, supplies and science experiments. Monday’s launch marked the debut of the Antares 230 rocket – fitted with Russian-built RD-181 engines that replace the AJ26 powerplants used by the previous iteration of the launch vehicle and identified as the culprit in the October 2014 launch failure. 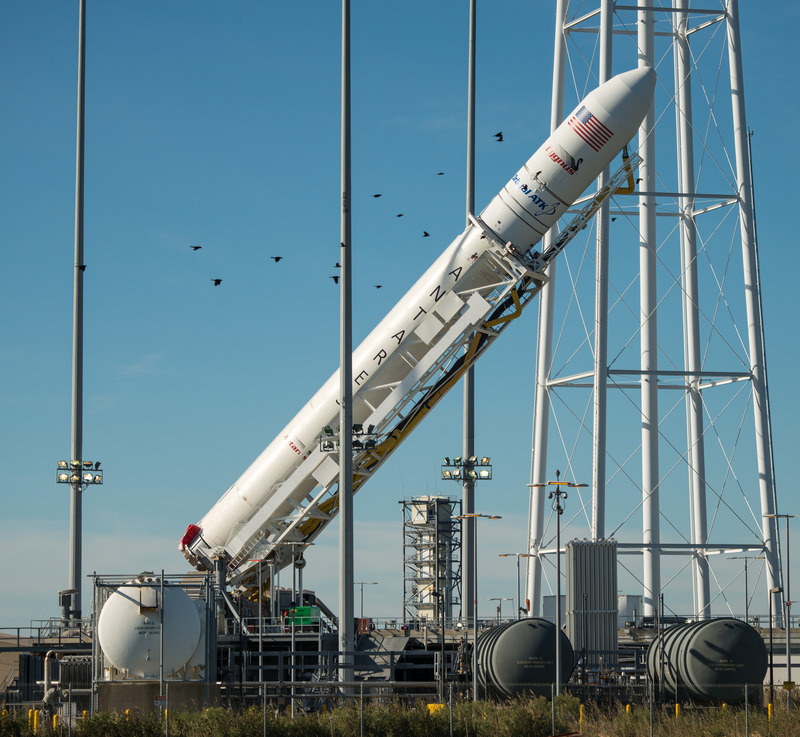 According to the accident investigation, it was a failure within the high-pressure turbopump system of the converted NK-33 in the Number #1 Engine Slot that caused Antares to fall back onto its launch pad seconds after lifting off with the Cygnus Orb-3 cargo vehicle. 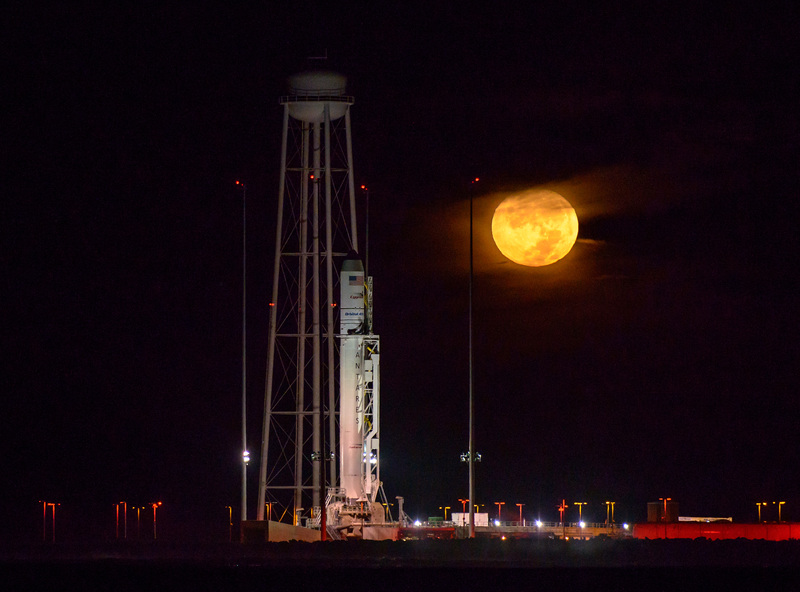 The 2014 launch failure came after Antares had flown successfully three times, debuting in April 2013 when lifting a mass simulator to orbit before flying a pair of Cygnus missions in January and July 2014. 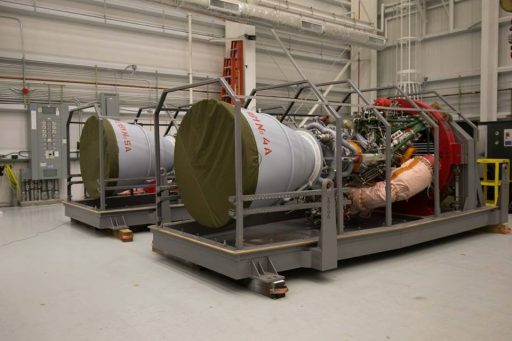 By that time, Orbital was already looking for new engines for the Antares rocket because Aerojet Rocketdyne only imported 43 NK-33 engines from Russia to be converted for use on U.S. vehicles. Originally built for the ill-fated N1 moon rocket, the NK-33 has been out of production since the 1970s. Problems with the AJ26 engines first emerged in a pair of testing failures in 2011 and 2014 before Antares took off on its fateful flight at sunset on October 28, 2014. Still in its initial climb-out from the pad, around 15 seconds after liftoff, Antares suffered an explosion on the base of its first stage before falling back onto its launch pad. 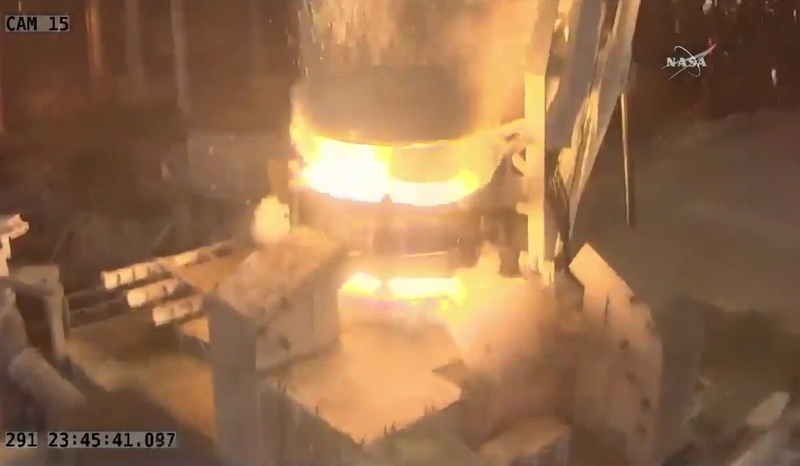 A powerful blast at the initial impact and a long-lasting fire fueled by the solid fuel on the second stage caused considerable damage to the launch facility. In the wake of the failure, Orbital decided to immediately abandon the AJ26 engines and accelerate the search for an alternative. Within two months, the company announced future Antares missions would use RD-181 engines procured from Russian manufacturer NPO Energomash that also supplies the two-chamber RD-180 used by the Atlas V. Both are based on the RD-170 four-chamber engine that used to power the Zenit and Energia rockets. Although RD-181 uses the same propellant combination and mixture as AJ26, refitting Antares was not a trivial task and was expected to create a lengthy stand-down. 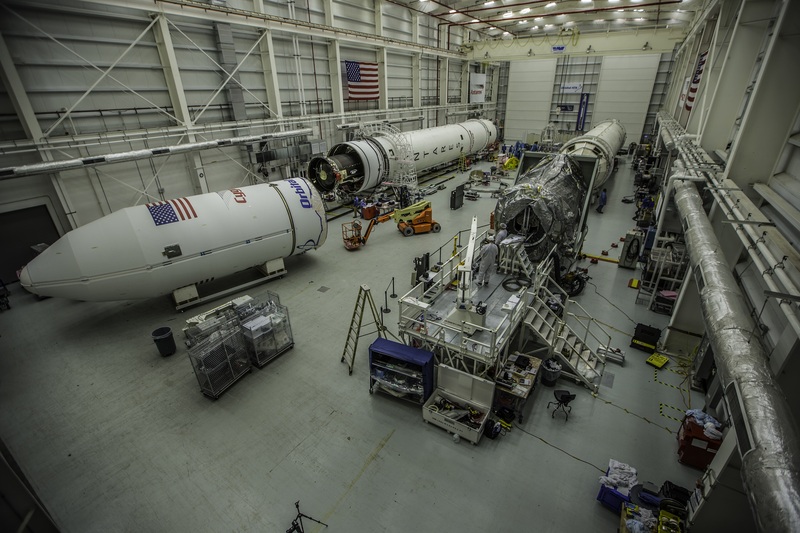 To bridge a gap in Antares missions, Orbital ATK contracted United Launch Alliance to lift a pair of Cygnus missions on the Atlas V rocket in December 2015 and March 2016 to ensure the company can meet the cargo quota agreed upon in the Commercial Resupply Services contact with NASA. The first Antares Core Stage with two RD-181 engines rolled out earlier this year and completed a 30-second test firing in May to verify the interaction of the new engines with the first stage and test out the repaired systems at Pad 0A following a full year of be-build efforts that came with a $15 million price tag, split between Orbital ATK, NASA and the State of Virginia. 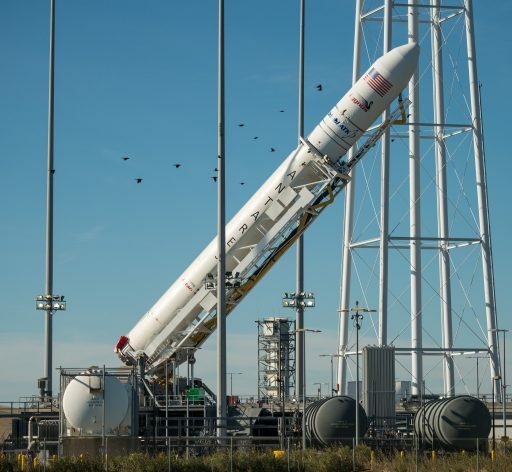 The first flight-ready Antares 230 was finally rolled to the launch pad on Thursday and placed in its launch position on Friday, towering 42.5 meters above its launch facility. 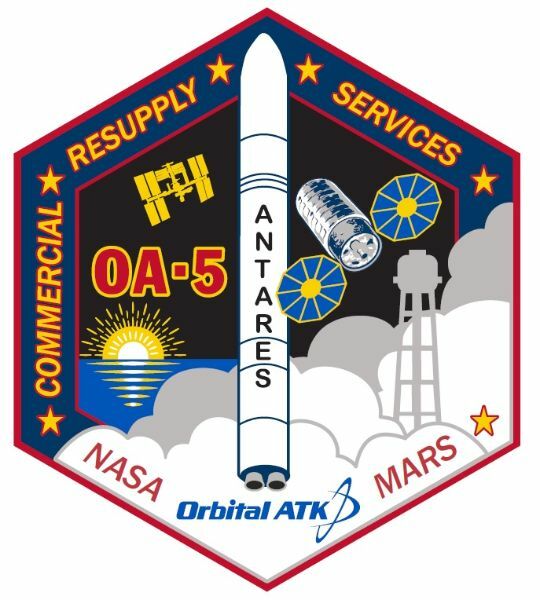 The Cygnus OA-5 mission is the first pairing of the Enhanced Cygnus spacecraft with the Antares rocket – the first two Cygnus missions with the extended cargo carrier were lifted by Atlas V.
Taking advantage of the Enhanced Cygnus version and the 20-25% payload increase with the more powerful RD-181 will enable Orbital ATK to launch more cargo to ISS. Monday’s flight also marked the first in-flight use of the Castor 30XL solid-fueled second stage, introduced on the unsuccessful 2014 mission as a larger and more powerful version of the Castor 30 used on the early Cygnus missions. The Cygnus OA-5 spacecraft was named the SS Alan Poindexter in honor of the late NASA Astronaut who served as pilot and commander on two Space Shuttle flights and supported many more from mission control. The SS Alan Poindexter is the first Cygnus to be named after an Astronaut who visited the Space Station. Cygnus is currently the only Commercial Cargo vehicle in a position to launch supplies to the ISS because its counterpart, the SpaceX Dragon, is standing down while SpaceX investigates the September 1st explosion of the company’s Falcon 9 rocket during a routine countdown to a test of its engines. Due to the uncertainty of SpaceX’s schedule to return to flight, NASA decided to shift some cargo from the upcoming Dragon flight to Cygnus OA-5 – pulling ballast mass (printing paper) from Cygnus and replacing it with other cargo items. 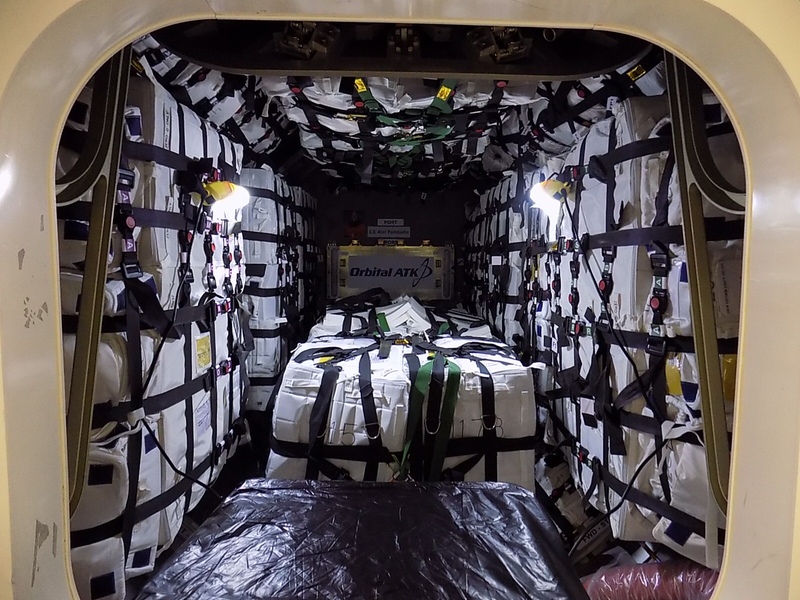 In total, Cygnus OA-5 carries 2,342 Kilograms of cargo of which 2,209 kg are usable supplies without packaging. The cargo aboard the spacecraft is comprised of the typical mix of ISS systems hardware and replaceable parts, supplies for the crew including food, spacewalking equipment, some Russian hardware, and dozens of science experiments to be conducted aboard the orbital laboratory. 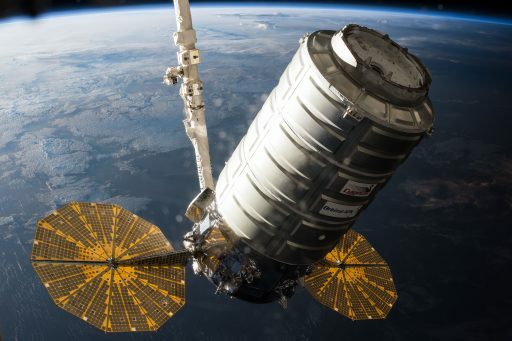 Cygnus is carrying a pair of combustion studies – one to take up residence in the stations combustion experimentation rack to study a phenomenon of two-stage combustion of pure fuels when burned as small droplets, characterized by a low-temperature second stage combustion not visible to the human eye. The second study is SAFFIRE-II following up on the first Spacecraft Fire Experiment to use Cygnus as a test platform after undocking to conduct experiments not safely possible on a crewed vehicle to examine large-scale burning phenomena. 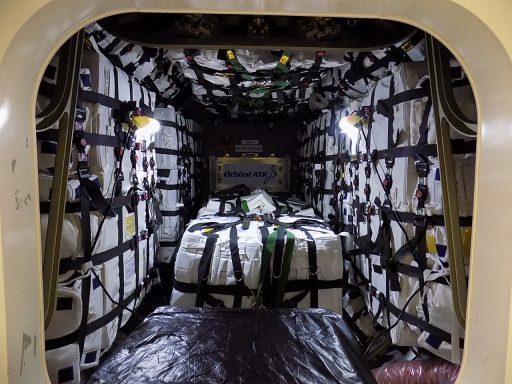 Cygnus also delivers new light fixtures to ISS that will be tuned to affect the crew’s sleep-wake-cycle as a countermeasure to poor sleep hygiene that is a common problem in spaceflight. Also onboard Cygnus is a new type of radiation detector capable of measuring high-energy neutrons which represent an important part of the radiation environment encountered by crews but have been hard to measure with previous detector systems. Residing on the outside of Cygnus is a NanoRacks CubeSat Deployer loaded with four Lemur-2 satellites operated by Spire Global as part of the company’s weather and ship-tracking constellation of CubeSats. These will be released after Cygnus departs ISS into a higher orbit than the Station to give the satellites a longer service life before re-entry. Antares Countdown operations formally began at T-6 hours when all Launch Team and Pad Support Stations were called up to support the several hundred-step-long countdown operation. The initial portion of the count was relatively bumpy as a number of open issues had to be closed out, delaying the departure of the pad team from the complex – leading to some catch-up completed by the Launch Team to finish the propellant loading setup and launch vehicle activation in time for the scheduled start of the tanking sequence. Subsystem activation was completed in a methodical fashion before the Launch Team pressed into several hours of testing operations including Mission Simulation Tests performed in coordination with first-stage-designer Yuzhnoye in the Ukraine. Antares passed all tests with flying colors and the Propellant Loading Sequencer was initiated at L-3 hours and 40 minutes to head into ground systems conditioning and launch vehicle purge prior to the start of tanking. Propellant loading picked up 90 minutes prior to launch to fill the first stage with more than 170 metric tons of Liquid Oxygen and nearly 65 tons of Rocket Propellant 1. Sitting atop the first stage, Castor 30XL had its solid propellant loaded as part of the manufacturing process – only requiring pressurized nitrogen to be used for the cold gas thruster system providing attitude control in non-propulsive flight. 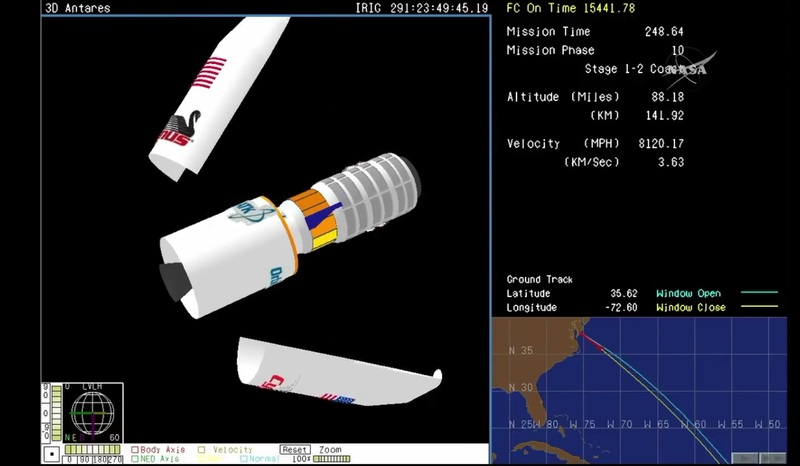 Propellant loading was by the book and closed out at L-15 minutes when Antares was also done with all checkouts and had received its flight software. A clean poll by the Launch Team gave the green light to press into the final countdown sequence. 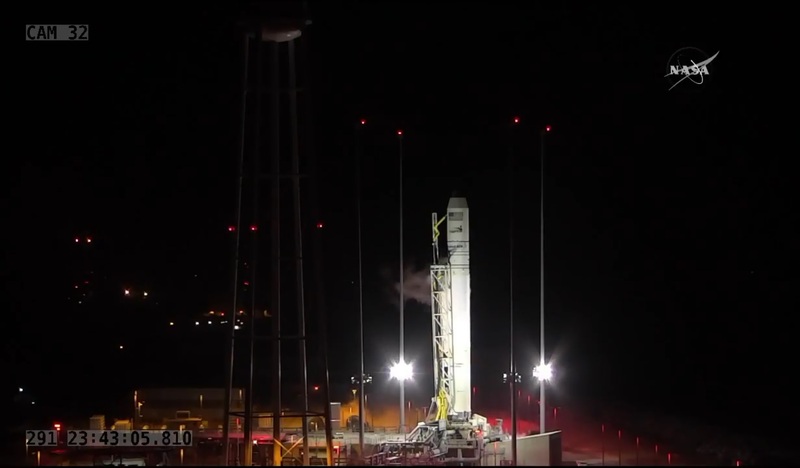 The Cygnus spacecraft was switched to battery power 12 minutes ahead of launch and Antares began preparing its engines for ignition. Because of a missing indication marking the completion of fuel setup on one of the two engines, Launch Control quickly pushed the launch to the end of the day’s five-minute window to gain enough time to re-command the sequence and ensure it was completed prior to committing to automated countdown. The Countdown Auto Sequence kicked in three an a half minutes before launch to transition the guidance system to flight mode, arm the launch vehicle and pressurize the first stage. The twin RD-181 engines were commanded to ignite the moment clocks hit Zero at 23:45:36 UTC and soared to a liftoff thrust of 392 metric ton-force with liftoff occurring 3.6 seconds after the ignition command was issued. Rising from its launch pad, Antares gimbaled its engines to move the tail away from the Transporter-Erector-Launcher – a planned maneuver that initially takes the base of the rocket closer to the TEL but then moves the exhaust away from the structure. The 300-metric-ton Antares climbed vertically for 15 seconds before pitching and rolling to a south-easterly course aiming to insert Cygnus into the orbital plane of the Space Station. Burning 1,750 Kilograms of propellants per second, the twin engines showed good performance according to calls made from Launch Control in real time. The first stage fired its engine for three minutes and 29 seconds, in the process accelerating the rocket to 3.7 Kilometers per second and taking it to an altitude of just over 100 Kilometers. Separation of the 27.6-meter long core stage occurred six seconds after main engine cutoff and signaled the start of 47 seconds of passive coast for the second stage to gain altitude so that the burn of the solid-rocket motor could inject Cygnus into a stable orbit. While coasting passively, Antares shed some no longer needed weight by splitting open and separating the payload fairing halves and dropping the interstage adapter. Castor 30XL fired up at T+4 minutes and 22 seconds to finish boosting Cygnus into orbit by raising the vehicle’s velocity by 3.9 Kilometers per second. Castor 30XL, six meters long and 2.34 meters in diameter – burned 24 metric tons of propellant in two minutes and 38 seconds, generating an average thrust of over 30 metric tons with a peak at 40,400 Kilogram-force. While the first stage flew a pre-programmed attitude profile, Stage 2 used energy management to dynamically adjust the flight path of the vehicle in order to meet the orbital target. 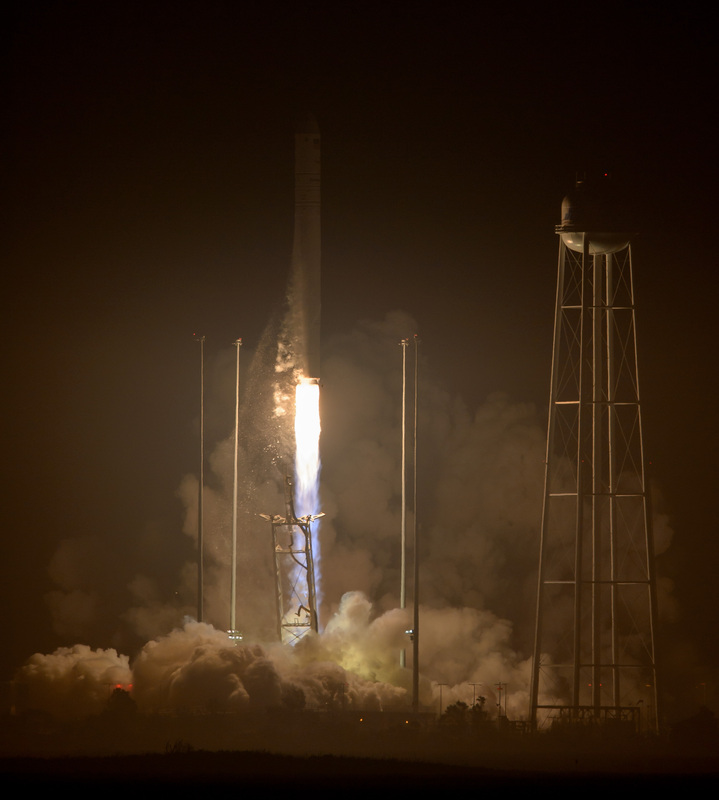 Antares was aiming for an orbit of 209 by 288 Kilometers, inclined 51.6 degrees, leaving the climb to the 400-Kilometer ISS orbit up to the Cygnus spacecraft. The second stage burned out just after the T+7-minute mark, but held the spacecraft for another two minutes to allow residual thrust to safely tail off to ensure a clean spring-loaded separation of the Cygnus. The insertion orbit based on telemetry from the second stage was given as 214 by 360 Kilometers, 51.62° indicating a slight overperformance which is no surprise given Orbital ATK only had theoretical knowledge on the precise performance of the RD-181-powered First stage & Castor 30XL upper stage. 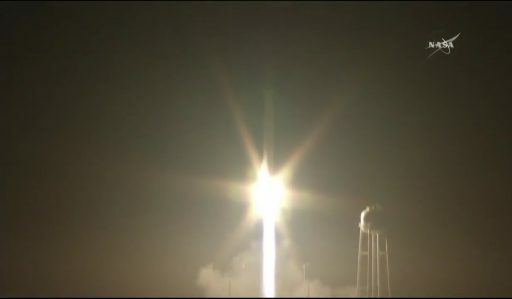 Spacecraft separation was confirmed nine minutes after launch into an acceptable orbit, marking mission success for Antares – coming back in stride after a stand-down of two years. 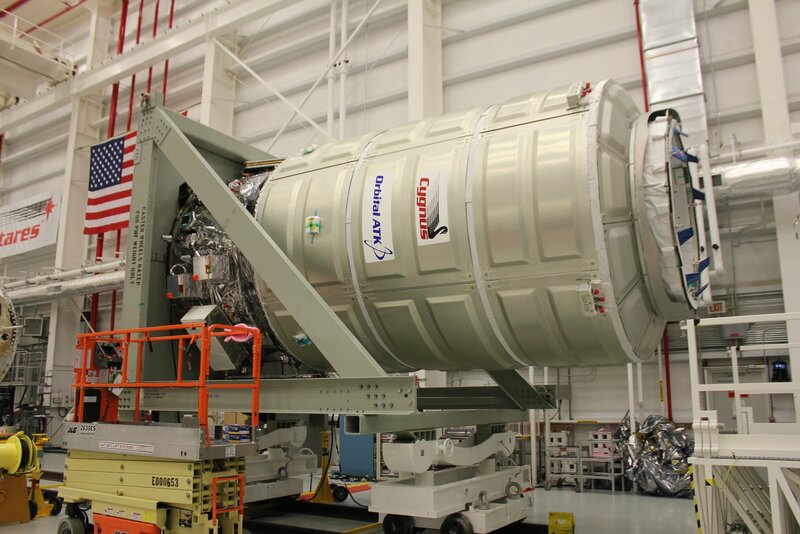 For Cygnus, spacecraft separation marked the start of its orbital supply run. Its first task was to establish a stable three-axis orientation and initiate communications through the Tracking and Data Relay Satellite System with controllers at Orbital’s Mission Control Center in Dulles keeping close watch over the first steps of their spacecraft. The critical deployment of the two circular UltraFlex Solar Arrays was initiated 90 minutes after launch and took 15 minutes to complete as the two solar array wings first swung outward before the arrays slowly rotated open. Due to the one-day launch delay from Sunday, Cygnus will have to complete an extended rendezvous, essentially making an initial climb close to the Station’s altitude and then entering an orbital parking slot to wait for the crewed Soyuz craft launching out of Baikonur on Wednesday to complete its automated docking on Friday. After that, the way will be clear for Cygnus to make its close rendezvous with ISS Sunday morning to set up for a robotic capture at 11:05 UTC.